Glory B Farms is nestled in the Grays River Valley just 2 miles from the historic Grays River Covered Bridge. Tom, April and their four daughters live on the Zimmerman Family Farm in Grays River. Tom has been farming since his family moved to the valley in 1976 He started with a small patch behind the house and now plants 10 plus acres in Grays River. Last year they added another 5 acre site in Skamokawa, Washington. Omega Farm is a WSDA Certified Organic pear orchard located in Ridgefield, Washington.We take great pride in producing only the highest quality bartlett pears. Their 60 year old trees are full size and the trees were planted 18 feet apart allowing for ample sunshine and air circulation between the trees in all directions. They believe strong, mature trees with adequate spacing provides the very highest quality of fruit. ProFarm Produce is a wholesale fruit and produce company that was founded by two brothers, Ryan and Shane Stonemetz, in the summer of 2008. Ryan and Shane are 4th generation farmers that had no desire of taking over the family business. They grew up watching their father and grandfather work hard every minute of everyday just to stress and wonder if the fruit warehouses controlling the market would pay enough to not only cover the expenses for the previous year, but also enough to provide for their family! 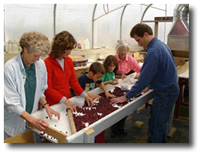 NW Organic is a family run certified organic farm located in the lush area of Ridgefield, WA. 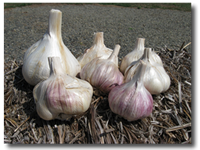 Their main crops are garlic and garlic curls. In May (french) shallots, sweet peas , green beans and Heirloom Tomatoes. 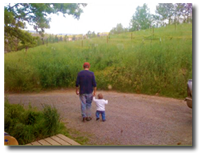 Gee Creek Farm is a certified organic family farm located near Ridgefield, Washington just north of Vancouver. We are certified organic by WSDA. The farm is named after the waterway that starts on our land. 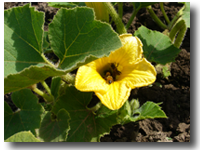 They produce a wide variety of crops, primarily vegetables and some fruit, all grown organically. Located in the east hills of the Hood River Valley, Ken Newman grows some of the best pears in the world. With the right latitude, perfect elevation, and terrific, nutrient rich volcanic soils Ken and his family steward their orchard organically and Bio dynamically.Newman family farms practice Old World farming methods utilizing bountiful wildlife and free roaming livestock. A healthy flock of wild turkey take up year round residence on the orchard. Bella Organic is a Certified Organic Farm on 100 acres of organic ground located at the beautiful Sauvie Island in the city of Portland. 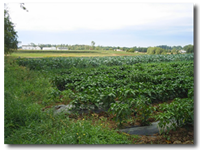 Bella Organic is a young and upcoming farm and our goal is to promote responsible farming practices. Columbia Blossom raises 16 different types of organic fruit on just 30 acres run by orchardist Jim Reed. Their produce is shipped in relatively small batches, within a day of picking (sometimes within hours). Hood River Organic is dedicated to being stewards of the land and growing good, healthy food for our extended community. 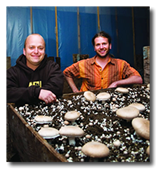 They operate with a similair land ethic centered around permaculture and organic production. 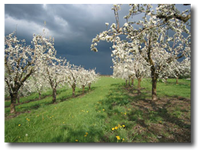 The 60 acres of orchards not only provide a scenic foreground for stunning landscapes of Mt. Hood and Mt. Adams, but also offer an insider´s view of a working farm that produces 1.2 million pounds and 20 varieties of apples and pears each year. 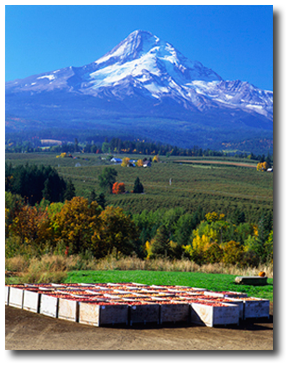 In fact, the Hood River Valley´s farms grow 30 percent of the nation´s winter pears. Walnut Hill Farm, owned by Tim Gilmer and his wife, Sam, is located in between Oregon City and Canby. In 1990 WHF adopted organic growing methods. 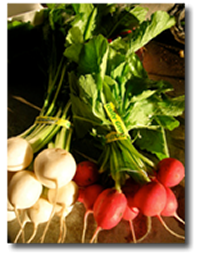 The farm has been certified organic by Oregon Tilth since 1995. 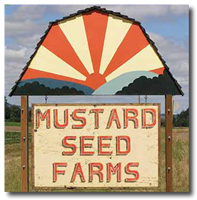 Mustard Seed Farm is located in the heart of Oregon´s Willamette Valley - in St. Paul, OR. 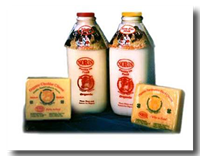 They have been farming the area for over forty years and have been certified organic since 1991. Started in 1991 by Sheldon and Carol Laeity, Your Kitchen Garden is one of our favorite farms. Located on 11 beautiful acres in Canby, Oregon, this farm is certified organic, and does everything the right way. Sometimes called "beyond organic", Sheldon and Carol use absolutely no sprays of any kind, ever. Kingfisher Farms has been growing organic produce for the past 20 years. It now produces 50 kinds of vegetables throughout the season. Jeff Trenary, the owner and operator of Kingfisher Farms, became inspired to start a community supported agriculture program seven years ago after traveling in Italy and observing a similar system of bringing freshly grown produce into homes. We have been working with Spring Hill Farms pretty much from the beginning. Spring Hill Farms supplies us with a wide variety of organic produce from their farm down in the Albany area, from lettuces and hardy greens, to zucchini, peppers, leeks, potatoes, onions, cucumbers, winter squash, and tomatoes, among other things. Winsmuir Farm is on the Oregon Coast, a little south in Sixes. They provide Dry Harvest organic cranberries. Persephone Farm is nestled between the south fork of the Santiam River and the foothills of the Cascade Range. They have been growing organic vegetables and premium Northwest strawberries in this stunning location for 21 years. The centuries old tradition of animal husbandry, rooted in Europe, is a mutually dependant and beneficial relationship between humans and cows. The quality of these fine relationships is based on longevity. Franz and Angela, the Noris farmers honor this tradition of their alpine homeland. Noris dairy cows are never given hormones or antibiotics and the cows are allowed to graze year round. For 30 years, Tom Denison has been growing produce and selling direct to Oregon consumers. Their 20-acre farm is located just north of Corvallis, overlooking the Jackson- Frazier Wetland. They aim to grow top-quality food for our local community. The Farm grows well over a hundred different varieties of organic fruits and vegetables. This allows them to have a wide selection of fruits and vegetables. Even if the weather or other conditions cause one or two crops to produce poorly. Groundworks is located on over seventy five certified organic acres just north of Eugene, Oregon along the Willamette River. This is their ninth season growing a wide variety of specialty fruits and vegetables for sale at farmer´s markets and through their Community Supported Agriculture (CSA) program. Wholesale deliveries to Eugene and Portland twice weekly also supply many of the areas best restaurants and markets.